More than 90 sensory activities including auditory, visual, olfactory, gustatory and tactile stimuli are described in the accompanying manual. 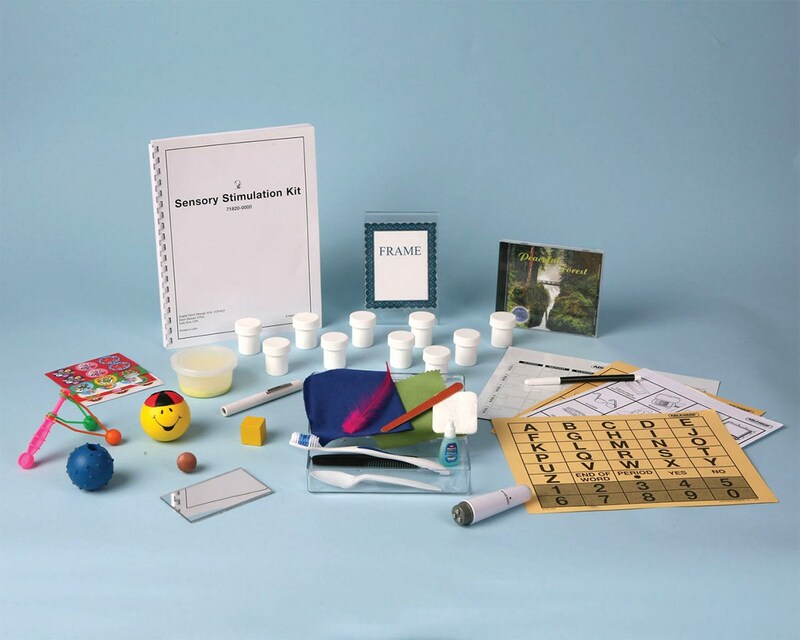 The client's responses to these stimulation activities may be used by the caregiver or clinician as a foundation for cognitive gains that can be made by implementing the cognitive activities that are also documented in the manual. Packed in a durable, easy-to-carry locking case. 13 1/2 x 15 1/2 x 6 1/4 in. (34 x 39 x 16 cm). Shipping weight is 7 lb., 13 oz. (3.55 kg). Disposable Single-Use Personal Cases can be purchased separately. They include a toothbrush, comb, plastic spoon, emery board, feather and square of cotton padding, velour and satin. Packaged in a clear plastic box with a snap-lock lid. Materials to be used by a single patient only. 1-year warranty.